With three posts about high state taxes and one about Saint Paul’s bad proposed minimum wage policy, I’ve been a bit of a gloom merchant this week. So, I wanted to send you into the weekend with some good news. This week, it was announced that the United States is now ranked #1 in the World Economic Forum’s Global Competitiveness Report. The United States, as one of the world’s great innovation powerhouses, is very well positioned in this new competitive landscape. It ranks first overall in the world in three of our twelve pillars; business dynamism, labour markets and financial system. It comes second in another two; innovation (behind Germany) and market size (behind China). For many, economic competitiveness isn’t an end in itself. It is a means to the attainment of higher living standards. And there is good news here from the GCR. As the chart below shows, there is a strong link between economic competitiveness and per capita Gross National Income. 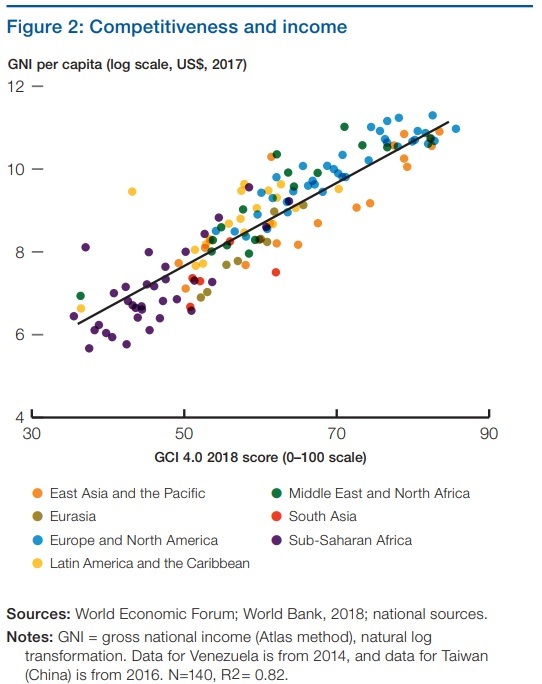 The WEF is quick to caution that these results cannot be attributed to any one administration, nor can they be taken for granted; countries can go down as well as up. But, for now, lets celebrate some good news.